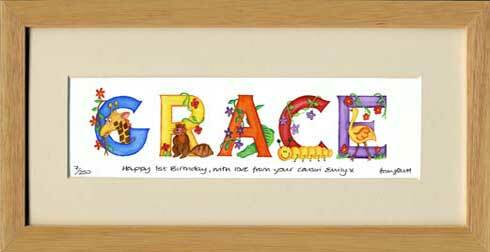 For names with a maximum of five letters, the name print is available in two sizes, small, 18 x 37cm and large, 31 x 60cm. …my picture arrived today. It was even better than the pictures on the website. I am so very pleased with it, it is really beautiful. Your service is also excellent, which is very refreshing indeed!!! Thank you so much.